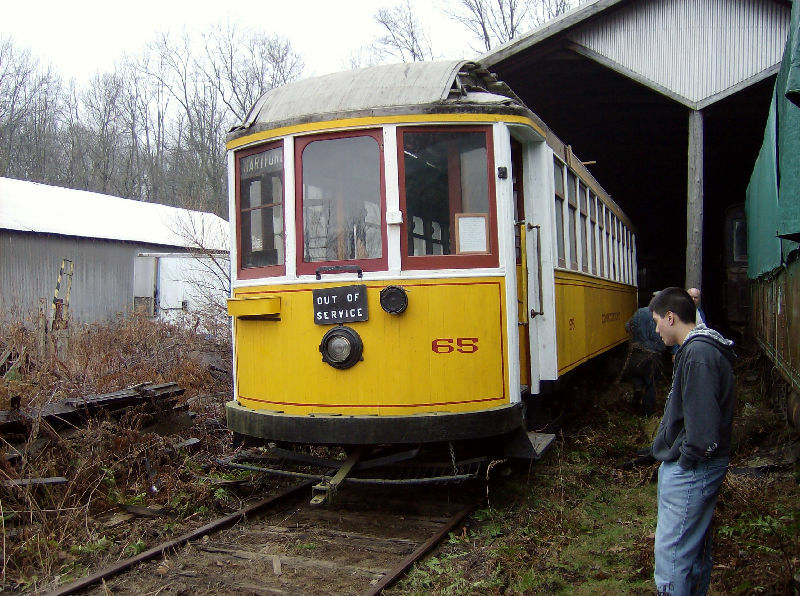 Connecticut Company Car 65 being pulled out of the Northern Car Barn at the Connecticut Trolley Museum. The car is being pulled out of the barn as part of a relocation plan for the trolleys at the museum. It is hoped that the car will eventually make it into the car shop for restoration. Car 65 was the first car the museum acquired. A few years ago, the pole was pulled out of the roof due to rotten wood. Restoration began on the car but was stalled. Hopefully, restoration can be continued in the near future. Photographed by Timothy Lesniak, January 13, 2007. Added to the photo archive by Timothy Lesniak, January 13, 2007.